XLS™ for Sale in Toledo, OH | ABCO SERVICES INC. Maximize snow plowing efficiency and performance with the next generation of FISHER XLS™ snowplows. With flared wings and more options than before, this snowplow now comes in two blade sizes and is offered in both stainless steel and powder-coated steel. Its wide scoop position carries more snow and can fully angle to maximize handling and capacity when cornering or plowing around obstacles making this plow ideal for contractors and municipalities in Toledo. 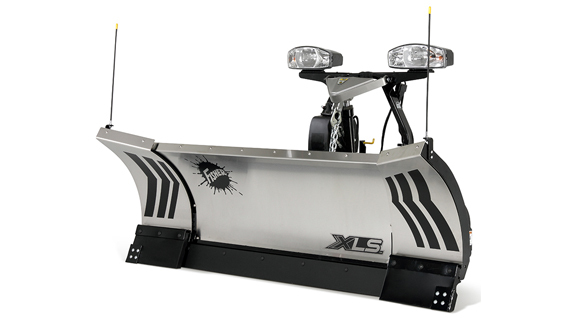 Available in powder coat or stainless steel, the XLS snow plow is available in two blade widths: 8'-10 and 8'6"-11'. The 31" tall, 14-gauge moldboard features independent wing control and comes standard with a 6" high-carbon steel cutting edge, increasing wear resistance, and the poly wing cutting edges feature trip protection. The blade is also pre-punched for easy accessory installation. The 8' XLS retracted blade extends to 10'. Angle the 35" flared wings forward for an 8' 10" scoop position. The 8' 6" XLS retracted blade extends to 11'. You can also angle the 36" flared wings forward for a 9' 10" scoop position. The next generation XLS™ snow plow features a heavy-duty torque tube and ten vertical ribs for substantial structural support. The tough construction of this channel provides rigidity and blade strength to eliminate buckling under extremely heavy forces. Hydraulic wing extensions slide laterally across the structurally reinforced slide box, constructed with 3/16" heavy grade steel to maximize snow removal capacity without buckling. The XLS plows feature flared wings as tall as 36" to maximize snow plowing efficiency at the touch of a button with Retracted Straight, Expanded Straight, Windrow and Scoop modes. The flared wing design can aggressively cast snow further while windrowing, making it the ultimate windrowing machine. The wings expand forming an even larger plow to move more snow and can retract for transport. The flared wings can be controlled independently, quickly changing the plow configuration from retracted to expanded, to scoop and to windrow. We produce our own hydraulic system to ensure the highest standards of performance, quality and reliability, giving you a plow that is powerful, responsive and built to last. All critical hydraulic components are fully enclosed for protection from the elements. Our industry-leading trip-edge design protects you and your equipment when encountering hidden obstacles. For improved efficiency and less cleanup, only the bottom edge trips, keeping the blade upright and plowed snow in front of the blade. The FISHER® trip edge uses compression-type springs that never require adjustment and will not wear out like extension springs. The XLS™ wings feature polyurethane cutting edges designed specifically to provide added trip protection. The reliable, mechanical attachment design of the Minute Mount® 2 snowplow mounting system allows for easy hook-up with no tools required and no electrical switches to fail and leave you struggling out in the cold. The FISHER® chain lift design offers a wide range of performance and reliability advantages over a direct lift system. Clean Scraping: The chain lift design allows the blade to continuously float while plowing, enabling it to freely follow the contours of the plowing surface for a cleaner scrape. Higher Stacking: With a chain lift you can stack snow higher because the plow's movement is not restricted by the length of the ram stroke like on cylinder lift systems. Reliability: With the simple mechanical chain lift design, there are fewer hydraulic and electrical components to worry about, so you can count on long life dependability. Easy Recovery:In the rare event of a hydraulic failure, you can push the snow plow up into a snowbank and short chain it to the specially designed bracket for safe transport back to the shop. With the FISHER® FLEET FLEX Electrical System, you have true fleet interchangeability. Unlike other manufacturers who require a different control system for different plows, the FISHER FLEET FLEX system lets you operate the following FISHER Minute Mount® 2 plows on any truck at any time with the same Fish-Stik® hand-held or joystick control. The exclusive SECURITY GUARD™ Anti-Theft System is a safe and secure way to electronically lock your snow plow whenever it is detached from your truck. Unlike physical locks that can easily be cut or removed, the system provides a deterrent against theft by allowing you to electronically lock the snow plow's hydraulic functions, rendering your plow inoperable to unauthorized users. Choose between the ergonomic Fish-Stik® hand-held control or the dash-mounted joystick control based on your preference. Both feature automatic shutoff, backlit buttons for night operation and LED lights, which indicate "power" and "float" mode. Additional features include programmable "soft-stop," "one-touch" float, built-in SECURITY GUARD™ Anti-Theft System, and plug-in connector for easy removal. See what you're up against better than ever before with the all-new INTENSIFIRE™ dual-halogen headlamps. They light up the road with brighter performance and greater reach – weather you're in high or low beam – plus, they're standard on all new FISHER® truck plows. The industry's best protection against wear and rust, the STORM GUARD™ baked-on powder coat with epoxy primer is standard on all FISHER® plows. An underhood module transfers lights from vehicle to plow automatically and improves system reliability by using plug 'n play, sealed electrical connections that comply with OEM requirements. Isolating the plow's electrical system from the vehicle's prevents the potential of electrical system damage in the event of a shorted circuit. Angling Rams 1½" x 10" 1½" x 10" 1½" x 10"
Lift Cylinder 1½" x 10" 1¾" x 10" 1¾" x 10"